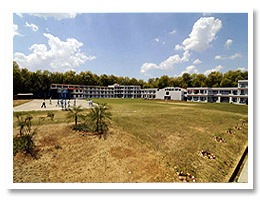 Institute premises are housed in well spread campus of more than seven acres. The buildup area is more than one lac academic_infrastructure2fifty thousand square feet. It provides spacious and well furnished class rooms and specialized laboratories. These include three laboratories each for biotechnology, microbiology, biochemistry and physiotherapy departments. Two pathology laboratories, two chemistry laboratories and one laboratory each for the department of botany, zoology, anatomy, computers and forestry. The campus is unique in having Wi-Fi facility giving instant e-connectivity to the Dolphin library and the world wide web. two separate hostels for the boys. The hostel has Wi-Fi too. A spacious, well stocked computerized library is available to our students and faculty for their academic requirements. Institute’s library spreads across six thousand square feet area and stocks ample number of books to cater to all levels of UG & PG courses requirements. The reading room with the sitting capacity of more than 250 students is well lighted and peaceful. The library also subscribes to reputed professional research journals and general knowledge periodicals. It gives added advantage to students to be aware of latest international developments in their respective fields. Library is well staffed and is headed by an experienced Chief librarian. 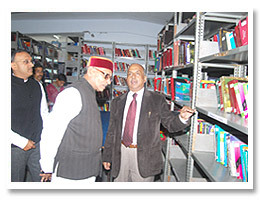 An added attraction is the introduction of e-library with multiple node facilities. This is further supplemented by fully WI-FI campus, giving freedom to students to consult the library from their class rooms itself. Girls hostel with Wi-Fi facility too. The institute has the objective of grooming the students to be competent professionals, the need of the hour. To complement the foundation laid in the lecture theaters, the institute boasts of state of the art laboratories. The large, spacious, well-lit and ventilated laboratories have been carefully designed keeping in mind the individual requirements of the students. There is provision of individual lockers for students working for their projects dissertations or internships. The Institute does not stop here. Recently the institute has been recognized for pursuing Ph.D. In the offing are laboratories for animal tissue culture that will be an asset for budding biomedical professionals and researchers. A plant tissue culture lab is present. Information technology acts as foundation for better access to information in society. It is a term popularly used to refer to the availability and use of advanced information services by means of a variety of high capacity data transport facilities, especially the computers and computer networks. Developments, in the recent past in this field have made the introduction of computer in educational institutions mandatory. It has affected the masses in such a way that its popularity has even reached in every stream of education and has revolutionized the techniques of teaching. Dolphin institute is committed to provide vital access and information concerning this field since inception. Thus, our faculty gets benefit of latest knowledge in their respective fields and makes learning experience a memorable and enjoyable activity for their students. On the whole, information technology is contributing as a gateway to advance sources of knowledge and ultimate success, preparing our students to become real winners.